Facilitate controlled improvement of the reliability of technological products by enabling the user to detect and remove the cause of faults early on. The test systems based on the well-tried modules of the WT and K series with increased power or heating, cooling and circulating air. The WK series also complies with customary climatic test standards. Powerful, homogeneous temperature and/or climate conditioning of the test chamber. The specimens are protected by an independent temperature measurement. 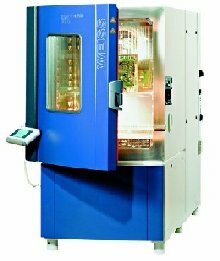 During the ESS test, the productsare subject to precisely defined stress so that defects in components and PCBs can be detected before leaving the manufacturer’s plant. Detecting weak points considerably improves the robustness of the products. Unreliable systems are filtered out before they reach the customers. The advantages of ESS are . . . Problems can be detected more rapidly.